With HydraBoost. Body & bounce. Free of: sulfates, parabens, phthalates, gluten, drying alcohol and artificial colors. 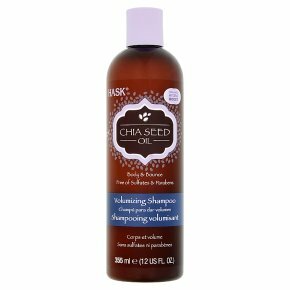 Not tested on animals.A weightless complex to help create fullness that speaks volumes Add fullness in a flash with Hask Chia Seed Oil Volumizing Shampoo. Cultivated in South America, the tiny seeds of the chia plant are known to be enriched with hair-volumizing proteins, antioxidants and shine-enhancing nutrients like omega-3s. HydraBoost helps enhance every wash to lift lifeless locks and add moisture without weighing hair down. How up-lifting! Directions: Apply to wet hair. Massage into a lather, rinse thoroughly and repeat if desired. Ideal for daily use. For best results, use the Hask Chia Seed Oil collection.